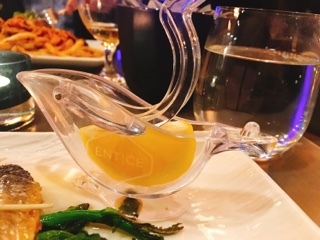 Entice Culinary Lounge’s current menu incorporates an assortment of cultures and flavours. Normally, I’m skeptical … really, can a chef actually master such different dishes and create something delicious? Truly, the creations aren’t traditional or authentic (such as our main of Korean beef ribs), but the menu reads like the popular dishes from each custom curated into one. The result: it’s not easy deciding what to order because so many items sound enticing. 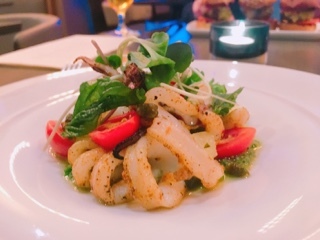 Even as the cast iron calamari ($15) was presented, I could tell it was cooked perfectly - the hot pan gave it a quick sear, leaving the protein tender. Since the squid wasn’t grilled, there’s not a strong smoky flavour, instead, the crispy garlic pesto shone through. Dots of fried capers were a nice contrast and the diced lemon segments a tart surprise, rather than the typical lemon wedge. 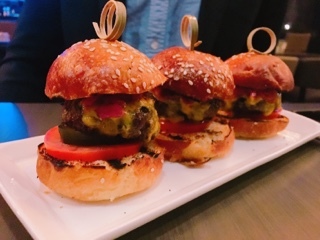 Despite the beef patties being cooked through (ideal for those who are squeamish about pink meat), the sliders ($15) were still juicy thanks to the bacon lardon pieces mixed into the beef. The flavourful patty held up against the slice of sharp cheddar, tangy pickles, and chili mix on top. Entice’s mains certainly don’t lack flavour. 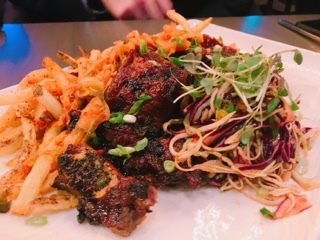 The Korean beef ribs ($27) had the customary sweet garlicky soy marinade with the caramelized barbeque char. Even the shoestring fries were topped with ample amounts of chopped kimchi for a sharp acidity; the spicy pungent vegetable means you definitely don’t need ketchup. Meanwhile, the vinegary Asian slaw was cooling, cutting against the rich tacky ribs. 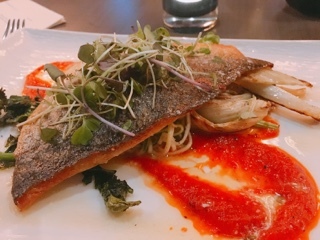 The sea bream ($27) was an excellent suggestion from our waitress, the fish’s skin so crispy it could have doubled for a chip, while the mild fish still moist. On the bottom, the zucchini noodles were light and satisfying; the roasted rapini and fennel adding an earthiness to the otherwise summery dish. Yet, I couldn’t help marvel over the lemon squeezing gadget – helps keep fingers citrus free while extracting so much juice from one thin slice. Even the desserts were tempting. Since we couldn’t settle on one, we had the peanut butter Nanaimo ($10) and pumpkin fritters ($10). The Nanaimo arrives deconstructed, the plate includes all the staple ingredients: milk chocolate, coconut chocolate cookies and a peanut butter cream. As an added bonus, there was a light coconut sorbet that had virtually no sweetness except for the natural coconut milk. 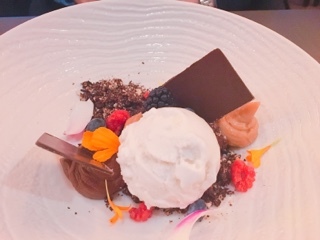 Although deconstructed desserts look pretty, I’m always disappointed with the final output – the ingredients are everywhere and in the wrong proportions. Even though I try to get a bit of each element, the ultimate outcome is never as good as having the actual dessert. In this case, I really wanted a taste of the dense creaminess generally found in the dessert, but ended up tasting coconut sorbet mixed into hard cookie bits. Luckily, the simple pumpkin fritters hit the spot. The warmth helped permeate the spices within the dough so you can smell and taste the cloves and cinnamon. 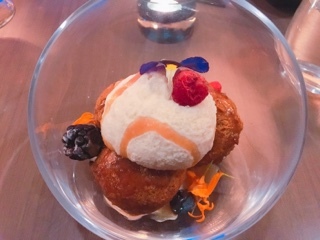 They were also dense enough that even as the maple ice cream was melting, the fritters didn’t become soggy, rather it just seemed like a pool of sauce for the doughnuts. For those who prefer drinking their sweets, Entice even has a selection of dessert cocktails: the il ciocclato sounds like an adult hot chocolate (complete with marshmallows) and the smashing pumpkins a warmed rum drink incorporating pumpkin puree and sweet potato syrup. For cocktail aficionados, you need to try the liberations at Entice Culinary Lounge. 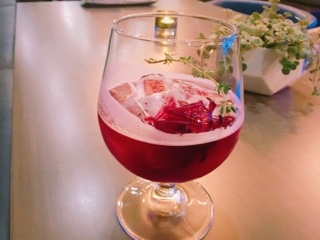 The city has really stepped up with great drinks and Entice doesn’t disappoint with unique and exciting concoctions. The entire bar staff came together to develop ideas for the menu and even make many of the syrups and infusions for the drinks. Take the Beauty and the Beast ($14), the cocktail starts with Pinot Noir that reduces by a third before adding hibiscus syrup and further concentrating in half. It’s put together with a shot of scotch (what I like to think is the Beast of the cocktail), except the Pinot Noir mellows the mixture and the drink tastes of Christmas morning. Inside, the cocktail is adorned with an edible hibiscus flower, which reminds me of the Chinese red preserved plums. 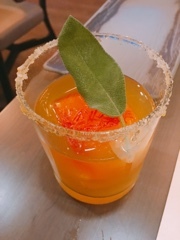 Although the sprig of rosemary used as the stem of the flower is a clever idea, I found it overpowered the drink’s aroma; to really appreciate the cocktail, I ended up removing the rosemary. 1001 Nights ($14) was concocted for the owner’s mother, who enjoys a tasty drink that’s not overly sweet. Somehow, she and I have the same taste. You can tell there’s tequila in the cocktail but along with Amaro Nonino, sage and cucumber, it’s but a whisper in the background. What I appreciated most about the drink was the use of saffron, which is rarely incorporated into cocktails. The prized spice was to pay homage to the mother’s Persian heritage, with large strands frozen into the ice cube so that as it melts the spice melds into the drink. Even the sugar surrounding the rim is infused with saffron so that it’s the first taste that hits the tongue. Justin Cleva, new Executive Chef of Entice, reveals that diners can expect the menu to change in December: with the cold weather, they’ll be adding comfort foods, but done in the elevated Entice fashion. Who knows, maybe it’ll become a collaborative effort again. If it’s anything like inventiveness of the cocktail menu, we’re all in for a treat.